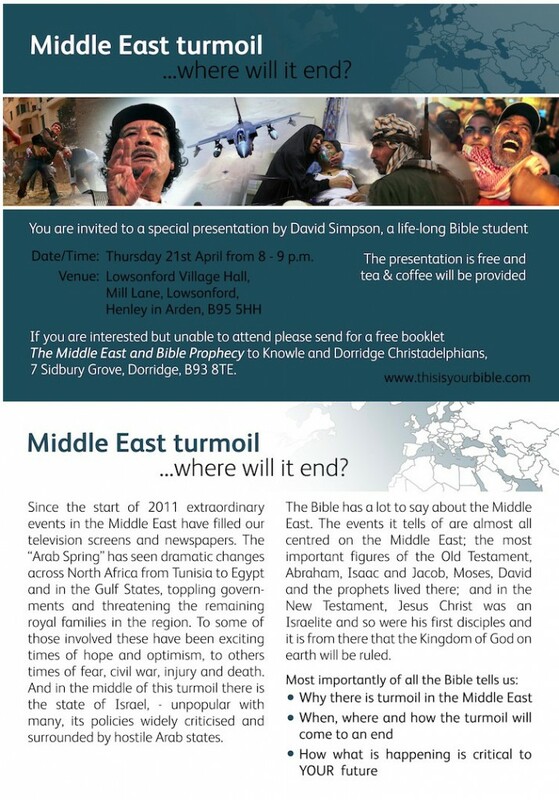 Middle East turmoil …. where will it end? This entry was posted in Israel, Middle East, Our Events, Our Preaching on April 1, 2011 by admin. In 2008, the nation of Israel marks 60 years since its foundation. Controversial years, and at times violent ones. The nation is at the centre of perhaps the modern world’s most intractable political problem, with the Israel – Palestine issue widely seen as the root cause of much of the terrorism and unrest that world leaders try in vain to deal with. Yet at the same time, the land called Israel has a special meaning to millions of followers of the world’s monotheistic faiths – Christians, Muslims and Jews. The Holy Land; the land of Abraham, of Jesus; a land of passion, of faith, of hope, of bloodshed. What is it about this land, and the people who claim it as their own, that makes both so special? Why do history and politics, in a real sense, seem to revolve around this small nation? The story begins somewhere between 3500 and 4000 years ago, with Abraham, or Ibrahim, honoured by Christians, Jews and Muslims alike. Once thought by some to be legendary, Abraham has become an increasingly believable figure as archaeology has revealed more about the sophisticated, civilised society in Mesopotamia – the ancient Middle East – from which he is said to have emerged, and to have migrated to Palestine at the call of the one God. The fortunes of peoples and powers throughout the ages to depend on how they treated Abraham and his descendants? Sounds a little presumptuous and far-fetched – until you look at history, and see how uncannily true the words of Genesis have proved to be, time after time after time…. Later promises go on to foresee a special relationship between God and Abraham’s descendants, a relationship that would last forever. Abraham’s descendants were to be given the land that Genesis calls Canaan – the land of Palestine: Israel. The land, God told Abraham, was to be theirs “as an everlasting possession to you and your descendants after you.” And through one of these descendants, the promises reiterated, blessing would come to all nations. None of the promises guaranteed that Abraham’s descendants – Israel, taking the name of Abraham’s grandson – would remain loyal to God throughout their history. Far from it: they strayed far from the faith of Abraham, as other Old Testament writings anticipated they would. But the reliability of God’s words was not to depend on Israel’s faithfulness: instead, the promises were to be irrevocable, their accuracy and fulfilment the proof that God is in control of the ultimate destiny of people and nations. Ancient history is by turns inspiring and barbaric. 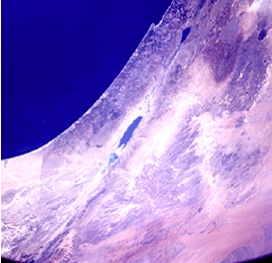 Supported by extensive archaeological evidence, it records the occupation of the land of Palestine by ancient Israel, their attack and often defeat by a succession of regional superpowers – Egyptians, Assyrians, Babylonians, Persians – their exile from their homeland in the sixth century BC and their later partial return, only to be brought into subjection first to Greek and then to Roman rulers, and eventually dispersed throughout the world. Over several hundred years the Hebrew prophets called, often in vain, for their people to come back to faith in and obedience to their God and His laws, warning them of the oppression, dispersion and suffering to which their own foolish choices would lead them. Like a parent, their God yearned for His children’s love and loyalty – unable to force them to love Him; grieved when they instead abused their freedom; yet never giving up on them, for His concern for them was irrevocable. However far they strayed, proclaimed the prophets, God in the distant future would bring their descendants back to their own land – and in doing so, prove to the world His supremacy over men and nations. Compared to the great powers of the ancient world, Israel – the Jewish people – were never more than minor players in international politics. Yet remarkably, it was the Jewish people that survived, their identity intact, while Assyria, Babylon and the rest vanished from the scene, buried often literally in the shifting sands of time – so completely that for a period, some questioned whether there had ever been such a place as Babylon. It was to a land occupied by Rome and its puppet rulers that, some 2000 years ago, Jesus of Nazareth came. In an obscure corner of the empire, over a few short years, one man’s life and teaching changed the world. And Jesus was a Jew – his identity as the long-awaited fulfilment of Old Testament predictions stressed in his own words and highlighted repeatedly by the Gospel chroniclers. Moreover, Jesus underlined the promises about the Jewish people – directing his hearers’ attention to the Hebrew prophets, and asserting that the Jewish people would continue, visible to the world, until God’s purposes with the earth were fulfilled. Rome too persecuted the Jews. In revenge for a rebellion some 40 years after Jesus’ ministry, their legions ravaged the land, expelled its people and looted the treasures of the Jewish faith. Roman monuments and relics record their triumph and the poignant suffering of the defeated Jews. Yet Rome too, in time, met its downfall, while for close on two millennia, the people of Israel were exiled. Scattered throughout the world, expelled from country after country to take refuge in others, they struggled against oppression and persecution – sadly often at the hands of the very Christians who should have seen in the Jews the foundations of their own faith. To any rational observer, the expectation would have been for the gradual assimilation of Jews among the various peoples and races among which they were scattered. After all, who could identify Picts, Goths, or for that matter Romans today as distinct, cohesive peoples? Yet a nation the Jews remained – continuing, in exile and in hope, to maintain their distinct identity – despite rampant anti-semitism, often sponsored by supposedly Christian rulers. Prejudice and hatred continued into relatively recent times, with organized massacres – pogroms –– in Russia and elsewhere among the most extreme examples. In the nineteenth century, some Jewish visionaries began to work for a solution to their age-old problem of dispersion throughout the world and persecution by so many. Most prominent among them was Austrian journalist Theodor Herzl, whose book ‘The Jewish State’ called for the re-creation of a physical, political nation of Israel – in its historic, Biblical homeland, then part of the ramshackle Ottoman (Turkish) Empire. 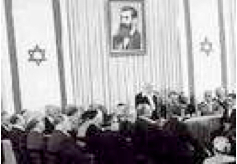 Under Herzl’s leadership the movement gathered momentum, while pioneering parties of Jewish settlers acquired land in Palestine and formed communities there, scraping a living from the land. The First World War proved a watershed. Britain captured Palestine from the Turks, and the government under Lloyd George had reason to be grateful to Jewish scientist Chaim Weizmann who had developed a new method of making the scarce chemical acetone for the munitions industry. 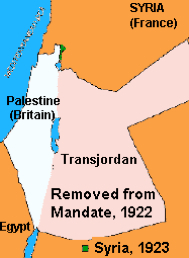 The Government issued a statement of support for “the establishment in Palestine of a national home for the Jewish people” – the famous Balfour Declaration – though Britain’s support was less unequivocal than it sounds, as it was making contradictory promises to the Arabs and the French at about the same time. Nevertheless, Britain took charge of Palestine, under a Jewish High Commissioner, Sir Herbert Samuel – the first Jewish ruler in the land since New Testament times – and for a period, Jewish immigration was welcomed. Yet the opportunity didn’t last long, and many Jews were slow to take advantage of it. Within a few years, Arab opposition led to restrictions on immigration, and by the time the storm clouds of war gathered over Europe, the doors were closing. As the full horror of Nazi Germany became apparent, Jewish refugees tried to flee – only to find ‘free’ countries, to their abiding shame, turning them away. Many were returned to their deaths. The appalling story of the Holocaust needs no repetition here. While the Nazis murdered Jews in their millions, Palestine itself escaped German invasion as the British halted Rommel’s advance at El Alamein – mercifully, since the Palestinian Arab leader and Nazi ally, Haj Amin al-Husseini, in exile in Berlin, hoped Hitler would provide “a solution to the Jewish problem in Palestine and the Arab countries, according to the same methods by which the problem was solved in Nazi Germany”. 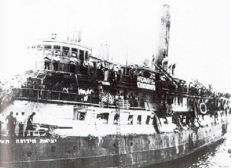 The Exodus – a ship used by Zionists to try to bring Jewish immigrants to Israel in 1947; the British refusal to let it land caused great controversy. Crusader state or chosen people? On May 14, 1948, Jewish leader David Ben-Gurion proclaimed the creation of the State of Israel. The new, old nation started with high aspirations, but in great danger. Attacked immediately by the armies of surrounding Arab countries, massively outnumbering the embryonic state, Israel was expected by many to be wiped out at birth. The aftermath of the 1967 war led to four decades of strife between Israel and the Palestinians, with the city of Jerusalem a particular international bone of contention. Or rather, “an immovable rock for all the nations” – the words of the Old Testament prophet Zechariah, 2500 years old and uncannily accurate….. But the fact remains that against all the odds, despite the worst that human wickedness could throw at them, the Jewish people have survived. The Biblical promises, of regathering to their historic homeland and of the restoration to productive fertility, have come true. The story of Israel is a story of survival, hope and restoration against, humanly speaking, impossible odds. It isn’t a story that shows the people of Israel, the Jewish people, always to be in the right, nor does it imply support for everything the modern country of Israel is or does. But it is a story with a meaning. To many, it seems incredible to claim that the Bible is infinitely more than a collection of ancient myths – that its promises are 100% reliable, that there really is a God who is in control of the destiny of the world and all of us, that there really was and is a Man who in the light of a spring morning, 2000 years ago, walked out of his grave: that Jesus really will reappear physically as King. To believe all this, you’d want solid evidence. The story of Israel is nothing less than a key part of that evidence. More than three thousand years of solid evidence – God’s ‘visual aid’, through history. Meanwhile, the Jewish people have survived, despite appalling persecution, as the Bible said they would. Returned to their own land, as the Bible said they would. Defeated their enemies, as the Bible said they would. Made the land fertile again, as the Bible said they would – the satellite image on this page is a picture of the Bible coming true. Solid evidence that you can trust the Bible, and believe the God who caused it to be written. This entry was posted in Israel, Middle East on May 1, 2008 by admin.